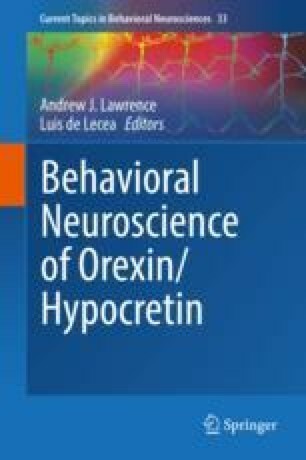 Orexins (hypocretins) are critically involved in coordinating appropriate physiological and behavioral responses to aversive and threatening stimuli. Acute stressors engage orexin neurons via direct projections from stress-sensitive brain regions. Orexin neurons, in turn, facilitate adaptive behavior via reciprocal connections as well as via direct projections to the hypophysiotropic neurons that coordinate the hypothalamic-pituitary-adrenal (HPA) axis response to stress. Consequently, hyperactivity of the orexin system is associated with increased motivated arousal and anxiety, and is emerging as a key feature of panic disorder. Accordingly, there has been significant interest in the therapeutic potential of pharmacological agents that antagonize orexin signaling at their receptors for the treatment of anxiety disorders. In contrast, disorders characterized by inappropriately low levels of motivated arousal, such as depression, generally appear to be associated with hypoactivity of the orexin system. This includes narcolepsy with cataplexy, a disorder characterized by the progressive loss of orexin neurons and increased rates of moderate/severe depression symptomology. Here, we provide a comprehensive overview of both clinical and preclinical evidence highlighting the role of orexin signaling in stress reactivity, as well as how perturbations to this system can result in dysregulated behavioral phenotypes. This chapter was supported by project grant 510778 from the National Health and Medical Research Council (NHMRC) of Australia and NHMRC CJ Martin Fellowship (Australia) 1072706 to M.H.J.